She was happily smiling about the golden goodness of the Susans. Susan from the top of a tall ladder! It was then she decided to climb to the top of a very tall ladder to see the garden as the birds see it! She was not disappointed at all! Sometimes a new perspective is just what's needed! She came away with good ideas for more natives to add to the mix! While sitting on the ladder, she couldn't help but think about the intense golden yellow of her sea of Susans. Even though their bright yellow isn't for every one's garden or taste. She knew it was perfect for the clay soil and uneven water conditions of her garden. She loved the way it made itself at home and that it was a Tennessee native plant! She loved it's acceptance of her Benign Gardening Style; especially, when mosquitoes and humidity make it unbearable to be in the garden. If you ask, she will tell you that she loves the bright color and cheekiness of the flower. She knew that they made people near and far smile. She was thrilled to learn that Karen (An Artist's Garden), who gardens way across the big Pond, had opened her heart and garden to their delicious color. Our heroine hopes that she enjoys her new color palette! It's with some sadness that our heroine has noticed that her longest blooming summer beauties are beginning to fade and brown~~She knows that the end is in sight and that all the Susans will, one by one, fade until they are a sea of brown. But, she finds delight in knowing the seeds may feed Goldfinches this fall and winter. Winter! Are we thinking about winter our heroine wonders?... She remembers looking wistfully upon the branching seed heads last December hoping that a bit of snow would fall and show their beautiful lines against the white. (Big sigh. There will be no such snows! ~~Such is life in a Zone 7 garden!) Wait a minute, slow down that imagination. Let's not fast forward too quickly! Our heroine acknowledges that it's hard to feel too melancholy when summer is still so golden! Warmest thoughts of you all on this beautiful last day of August! Ah the twofer once again. Well, dear Heroine on the ladder, great idea that, while it is good and wise to think ahead, ten years is a nice round number, enjoying the here and now is also good and wise. The delightful susans of C and L make the whole world happy as we can view them and oooh and aaah on the world wide web. Might a suggestion be put forth? The Carex family has proven itself in the unusual conditions of little soil over huge stones. There are so many good ones, with the elusive evergreen quality we have discussed many times. You can take it from there if you wish. I have been thinking those same thoughts for my own space as well. Have a glorious day! With the Susans about to pack it in. Their seed full heads beginning to nod and the Practically Perfect Phlox merely a whisper it is time to think about the next years garden. Sitting upon a ladder contemplating the garden is a good thing.A different perspective giving one a head full of ideas. No time for meloncholy, not with those bright smiling faces of the Susans still glowing on the landscape. Have a great last day of August. May the snow fly on your garden this winter. Dear Lisa, Good morning and thank you! You are up early today...the sun is still behind the trees and it is about 59 degrees. Fall really is in the air...I bet it is chilly where you live! Have a splendid day! I tell you I'd much rather sit on a ladder and contemplate a garden than sit there and saw or prune-like I always seem to do. I have to smile at you doing that. Summer's end is near and it is sad to see another year go. You have a great day. Don't mention the "W" word, at least not yet! There's still too much to do around the garden. Our Susans are almost done but still showing a little color. Good morning Gail, I think the Susans are so bright and cheery. My pleasure is feeding the goldfinches late into the year by leaving the seedheads. I sometimes take photos from the second story window...what a different prospective. What a perfectly happy-looking sea of gold! Like something out of a gold bazaar! Are you sure none of those fairy-tales about the king's golden cloak, or streets paved with gold, etc., were written in your garden? Wait, what? Susans ARE for everyone's garden! :) Ladders are not. LOL. The heroine dreams in her golden garden;) Don't the Susans always bring to mind the Frost poem "Nothing Gold Can Stay"? Bittersweet. We have one more big display of autumn gold and red before the dreaded winter. Personally, I'm of the opinion that one cannot have too many Susans in the garden, especially since Goldfinches love them so much. :) They look like flowers themselves as they perch atop the seedheads. Great capture on the tripod. Your garden truly looks golden. Lovely, just lovely. Susans are gone here, but little plants have seeded about in the paths, needing transplant at some point. Why don't they seed about in the beds? Do be careful on the ladder. Missing the bottom step is how I hurt my knee. Once injured, a joint is painful from now on. Great view from the ladder! I can't believe summer is coming to an end, I think the golden yellow is a very fitting color for the beginning of autumn. What a lovely view from the ladder! Please don't talk of winter yet; it feels like we hardly had a summer and I want to make fall last as long as possible! I can just imagine you up on the ladder with the camera & the neighbors shaking their heads. We gardeners just can't leave well enough alone, we're always "improving" our gardens. I can't wait to see what you'll interplant with the Susans. Beautiful display! I tend to think of grasses with susans, too. Probably because of what we see growing in natural meadows. What can I say Gail - I am easily lead! Lovely images, I am particularly taken with the third one. 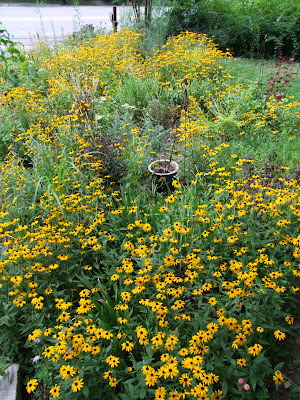 What a great post, and I totally love your meadow garden with the Susans and Phlox. Ah yes. My Susans have also seen better days. I've cut them back once already. Will have to do it again soon. Seems like time is flying now that the weather has turned (for the better thankfully!). Love your ladder shot! OH how delightful to read this! I have noticed very few birds at my feeders cause they are feasting on the seeds. It must be amazing to look out on that sea of yellow. I nominated you for a meme today. Come on over to my blog to see what it's all about. Such lovely flowers and photos thanks for climbing up ladders to show them to us . Incredible, the perfect summer blossom! Loved seeing the photos from above. I had one black eyed susan plant survive this year and it brought me such joy to see it shining its bright yellow smile everyday. Your Susans are stunning and I so enjoyed the stroll through your garden. The Prairie Suns that I planted and nurtured last year didn't return and I am mourning their loss. There's just something about those Susans, isn't there? so many susans so little time...beautiful capture from your perch. careful up there you might get used to it. I've missed a few posts Gail so I spent a little time reading this morning and catching up. Your butterfly photos are just amazing but that dreaded four letter word (snow) is what jumped at me. ugh. I'm so not ready for winter and now everyone from the Farmers Almanac to the locals are predicting a horrid season ahead for us. It makes me shudder. So I guess all the more reason to appreciate the last days of summer, right? Hopefully your beautiful susans will hang on for quite a while to come. Have a great holiday weekend. PS Fun to learn those new tidbits about you ~ I would never have guessed you were an introvert from "meeting" you over the Internet. The writing class sounds interesting.